hello again friends and curious insomniacs. and my discerning eye caught an anomily-or was it? 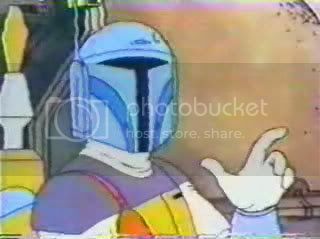 here we have a young boba on a certain holiday special that no one would like you to remember. yep, he is short a finger...oversight? let us move to evidence B.
conspiracy or shotty animation or something altogether more sinister! boba a shape shifter? Maybe his little finger was out of shot? Or maybe it was stuck in his glove? If you look closely you can see it. It's colored a dark gray so it blends into the background. I'd say animation or production error. It looks more like an animation production error to me too. Which would make more sense as Boba did not even like shapeshifters. It could also be that picture #1 shows his left hand whereas in picture #2 it's his right..... So just the left hand is missing a finger. Probably to try and convey emotion. Silly cartoon. Hahaha. This made me laugh a great deal. I like the finger stuck in the glove thing. That was aaaaaaa good one. It is likely just a mistake. 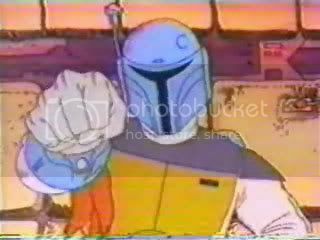 i agree that in no way is fett a shape-shifter. i was just clowning around. definitely bad animation. if you look at other frames- in some he has four finger and some three. lucas arts ur on the list! But I agree with Draco, if you loos closely, you -can- see the outline of his pinky, they just didn't color it in! Thats not his pinky, it is like a pipe or something in the background. You can tell because it doesn't connect to the palm, and the fnger would be at a very very very very strange angle. if you have an oppertunity to look at the onther frames, youll see that he has only three fingers in some. were told that fett might not be human. but alas i agree that this is a "nothing" topic. but thats me, i live in the details. It could always be that the artist drew the outline, then when the guy went to color it in, he thought his pinky was a pipe, and didn't color it in. ...back with another interesting find! i suppose interesting could be a relative word...but anyhow. im genuinely curious- i think he is reffering to fett but he could also be talking about the predator. I would have thougth it was based of Predator althogh they arn't bounty hunters. But he did fire a flame thrower from his wrist. They could have based it of both of them though. who doesnt like reheated leftovers? M I right? i am wondering if you like the original sarlacc or the new one with a beak-and squeeling like a pig? Oh I hated the "edited" sarlacc. I think Lucas did that so there was no real way that Boba could crawl out of the sarlacc - bad man. the old sarlacc was alot more intimidating cause you didn't really know what it was. Fear is based on the unknown so when the made it look like a half buried bird that had a octopus for one of its parents they kind of killed the mystery. like sitting in in a glass of pepsi...or even less acidic. if u made it past the beak, you would be fine. it would be like a hottub, albeit a foul odored one. It is a production error. Unless these take place after the movies (proving he survived) then you can look in the movies, he has 10 fingers. So, this is a simple animating mistake.